Per a website opened by the Braves called HomeoftheBraves.com, the Braves will be moving to Cobb County in 2017. The move has apparently been in the works for a while now, and something that was frankly going to come to a head since the Turner Field lease is set to run out soon in 2016. Now that it's confirmed on the new location, I can add my commentary to what I think of the move. Our new location will give us the opportunity to develop the surrounding area of the new ballpark, transforming it into a mixed use, 365-day destination and creating an enhanced atmosphere for our fans during Braves games. There also will be significantly increased access to the site, enhanced parking opportunities, and, generally, easier access to and from major roadways with a variety of other transportation options. As you can see on the picture, the site is just nestled in the North side of 285 and West side of 75. The Braves are being kind when they say certain issues have come up with Turner Field that are insurmountable. Let me be very clear what they mean by that. We all know that putting a stadium downtown is horrible from a traffic standpoint, and dealing with the city of Atlanta and Fulton County meant you have corrupt people trying to put their hands in your pockets whenever you build something. Ask Arthur Blank how many kickbacks and "neighborhood" payments he's had to make to get that Falcons deal done. There's a reason that budget keeps going up every 6 months, and the thing isn't even on the ground yet. The Braves have hated their location for a long time, as have the fans. It's in a terrible neighborhood, surrounded by absolutely nothing in terms of restaurants, bars, or any kind of livable space. 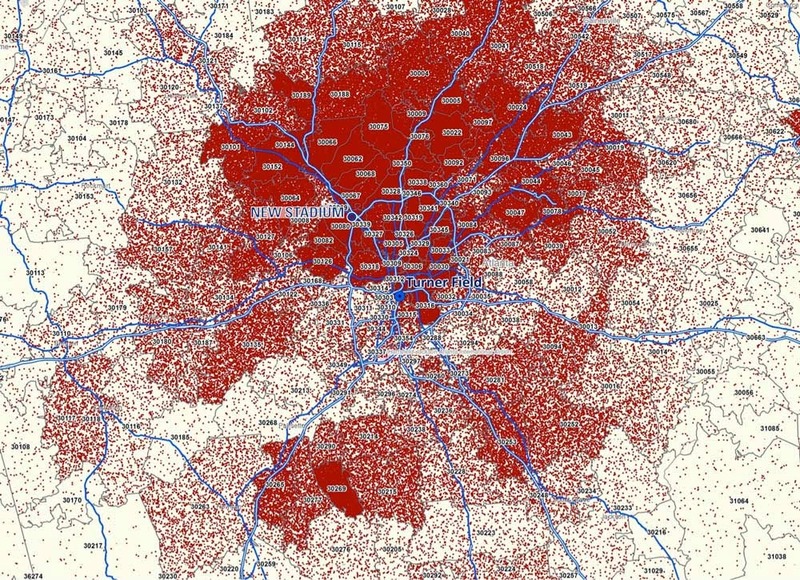 For the most part, the Braves fan demographic is primarily living in the North part of Atlanta. They did several studies on this in the past and realized how much revenue they were losing because people didn't want to travel from Alpharetta, Sandy Springs, Roswell, Marietta, Dunwoody, and Kennesaw, dealing with the primetime traffic of the 75/85 canyon, and not getting home until midnight after a night game. While MARTA is a very viable option to a place like Phillips arena, it's never been a good option to the Braves, making fans not only get on a train, but also walk through a wretched hive of scum and villainy that is Underground Atlanta, just for the privilege to get on a bus that takes you to the stadium. Whenever you watched people make this trek through Underground, you could always spot the Braves fans, trying to move as fast as possible and not making eye contact with anyone. Yeah, that's a good plan, make the people dramatically uncomfortable just so they can hop on two forms of mass transit crammed cheek to cheek with the masses. As a result, most people opted to park, just adding to the traffic problem of downtown, and the lack of overall spaces around the stadium. 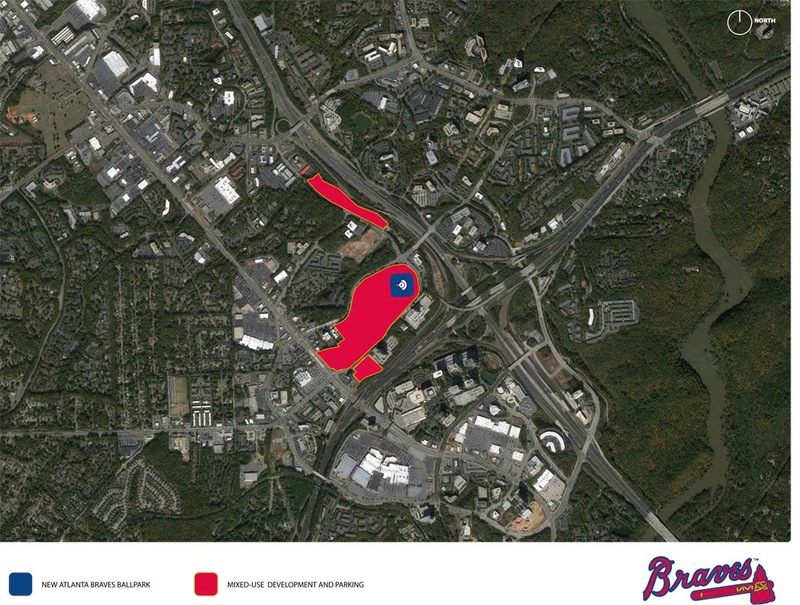 A cottage industry of parking in several ghetto locations will probably be affected, but I don't think the Braves feel sorry about that at all. The solution is to forget public transit. It doesn't work in our town for lots of reasons, but the main one is that people don't want to wait around for trains and busses with their families, and they like the freedom that driving gives them when coming or going. The solution was a site that offered a ton more parking that was much easier to get to than the small exits to Fulton Street off the 75/85 access roads. Also, it offers a chance for businesses to thrive around the area. Nobody was going to open a restaurant or bar near the current stadium. Up at the new location? There's already a ton of restaurants and hotels, bars and clubs, and shopping areas already in place. Fans want to be able to go to a game early, grab dinner, and walk over to the stadium all within reach. The most successful baseball parks in the country like Boston, Philly, New York, St. Louis, Chicago, all have surrounding cultures nearby the ballpark. They create these neighborhoods that transform on gamedays into wonderful hubs of food and fun. That's what the Braves are gunning for with this move. Also don't be confused, they want to get closer to their customers. They know who and what kind of people go to Braves games, and this move puts them front and center for their audience on the North Side. It also gets them away from the clutches of the City of Atlanta government, and all the tax/corruption consequences that come with such a deal. See that heat map? 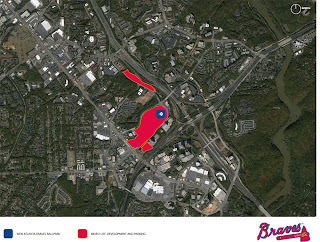 The red represents the ticket buyers for the Braves. Note the GIGANTIC swatch of Red that exists to the North of the Perimeter. If there could be any further doubt as to why the Braves wanted out, this spells it out in full color. 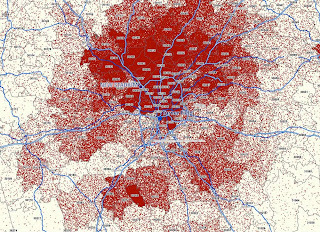 You have to put your product in the hands our your customers, and not enough of them lived in the Atlanta city limits for that location to make any sense. I'm thrilled by the move as both a fan, and a person who enjoys not being hassled by the seedier elements of downtown Atlanta, the traffic, and the terrible public transport. Plus I enjoy people sticking it to Fulton County, who for years has tried their best to keep their foot on the throat of sports in this town, nevermind the fact that the majority of paying fans don't live there. Kudos to the Braves, Kudos to the front office, and I look forward to seeing my tickets in the new stadium.